Manhattan Prep's Complete GMAT Strategy Guide Set features 10 books written by active instructors with 99th percentile scores. Designed with the student in mind, each book delves deeply into a single area of the exam, providing detailed and specialized instruction for students looking to score in the top percentiles. This set includes one year of access to Manhattan Prep’s online computer-adaptive GMAT practice exams and Question Banks. When used together, these 10 guides produce a substantial learning impact, helping students develop all the knowledge, skills, and strategic thinking necessary for success on the GMAT. The 6th edition has better structure in quant and substantial improvements in Verbal. See my comparison vs. 5th edition below. 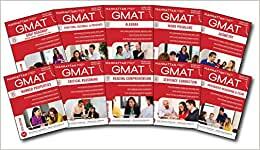 Between these 5 books you should have 80-90% of the GMAT covered and the rest could be picked up from the remaining books and practice with the Official Guides. You can throw in a Kaplan Premier as well - a good intro to GMAT book with 6 free GMAT Tets. It is a good starter book to get your feet wet, but definitely not a must. To make the most use out of the MGMAT guides, you will need the Official Guide 20015 and also OG Verbal 2nd and OG Quant 2nd editions are recommended. The guides refer to these 3 books for additional practice questions. If you own previous versions of the Official Guide books, you can use those too with a translation table available from MGMAT's website. *** Each book comes with access to 6 online gmat tests and additional question banks. Don't spend money on these as they are pricey ($40 for 6 tests on the MGMAT website). Also, if you are new to the GMAT, download 2 official practice tests from GMAC and take one of them before you start prepping to get your level - very helpful to track your progress along the way but don't waste these tests - they use real retired gmat questions and though it is possible to recycle them (there are close to 900 questions in the banks), would recommend you use something less valuable for your practice such as MGMAT tests included with these books). One more thing, don't rush into questions and tests - you will only hurt your self confidence, instead methodically cover each math and verbal topic and only after you are done with each of the sections move on to take the tests (take math only after you are done with math and verbal only after done with verbal). Final word of advice - the main mistake (esp in verbal) is not following strategies. Whichever books or strategies you use (they are all pretty similar between MGMAT, PowerScore, and Kaplan) - follow them EXACTLY. These people are getting big bucks to develop methods to improve score and maximize performance - don't try to be smarter and change things around. Unless you are scoring 750+, I would follow each step of the strategy to the "T". If the book says to read the CR question twice, then that's what you do even though it may seem that it is faster to read it once - trust me, there is a reason why you read it twice. If you want to get 700+ and not worry about the GMAT, stick to the strategies and keep creativity low. Overall, all books have undergone some degree of updating; not just slapping a new cover as some providers do, so you will be better of buying the 6th if you are deciding. If you own the 5th edition already, I would recommend getting only the IR and RC books, however as they have undergone the most transformation. The rest is organized better (more logical); it will help those who are short on time; the pages now also have more graphs, charts, and cheat sheets at the end (a number of books added this feature including Geometry and CR). CR - Improvements in text-heavy areas that put people to sleep before. Cheat sheets added after each chapter. I do like pre-thinking, however, in CR, so I still feel that CR book can be improved. P.S. 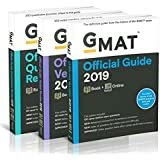 Let me know if you have any questions about GMAT Books - I reply to comments and appreciate any feedback (especially negative and suggestions for improvement). 5.0 颗星，最多 5 颗星THESE REALLY HELP! I bought these books to prepare for the GMAT - I haven't taken a standardized test in years! My first practice test put me at a 650 so I know I had work to do. I poured over these books and studied four hours a night after work and every weekend for two months. The combination of these books, the GMAT Original Guide Bundle (buy those for practice problems), and hours of studying produced a 760 GMAT score!!! Highly recommend for time-saving tricks, comprehensive review materials and common-sense explanations. Same set as from the Manhattan website but much better price. Very effective tool for studying for the GMAT. I did not purchase any other GMAT studying tools besides this set and the Official Guide set and they were sufficient for a 750+ score. Throughout the strategy guides, the content focuses on building a strong foundation in mathematical and verbal concepts. The guides build on these concepts by introducing useful strategies to conserve time and solve common types of problems that are likely to be on the exam. Do not rush straight to the practice problems and quizzes, as this could quickly lead to discouragement. It is essential to master the concepts first and then apply them to the practice problems. The integrated reasoning section and essay section are condensed into one strategy guide, as both topics build on the mathematical and verbal concepts developed through reading the nine other strategy guides. While working through the essay section, keep in mind that the essay on the exam will prompt you to evaluate an argument and critique its strengths and weaknesses. Purchasing this book set provides online access to six CAT exams that simulate the content and structure of the actual GMAT exam. While the algorithm is not the same as GMAT’s proprietary algorithm, it provides a useful resource to measure progress and build up stamina for the actual test. When taking these exams, it is crucial to simulate the actual testing environment to get an accurate estimate of your official GMAT score. My suggestion is to take one exam initially to see where you stand, then focus on the topic areas you struggled with. Through mastering the content and working through the practice problems included in this book set, readers can expect to build a strong foundation in mathematical and verbal concepts required to master the GMAT exam. When in doubt, follow the strategies described in the guides and do not get discouraged. Good luck on your exam! Great set of guides. I hate standardized tests but I decided to give self studying a try. My first practice test before I started studying I got a 490. I went through all of these books and the OG guide in 3-4 months. After that I was scoring around 580s on practice tests. I took my official test in October 2015 and got a 640. Buy these along with a solid study plan and it can be a great alternative to hiring an expensive tutor.